We had a big holiday party at our house last weekend. It rained but we had a huge turn out and it was a lot of fun. Seriously, when the forecast showed rain, I wasn't thrilled but was still happy because it's rain. Last year, the day of the party, we had a snow storm. Not good. Not good at all. This year, knowing there will be about 70 people, we hired a chef well in advance. I did not even attempt to cook. But since baking is easier to be done in advance, I chose to go that way. 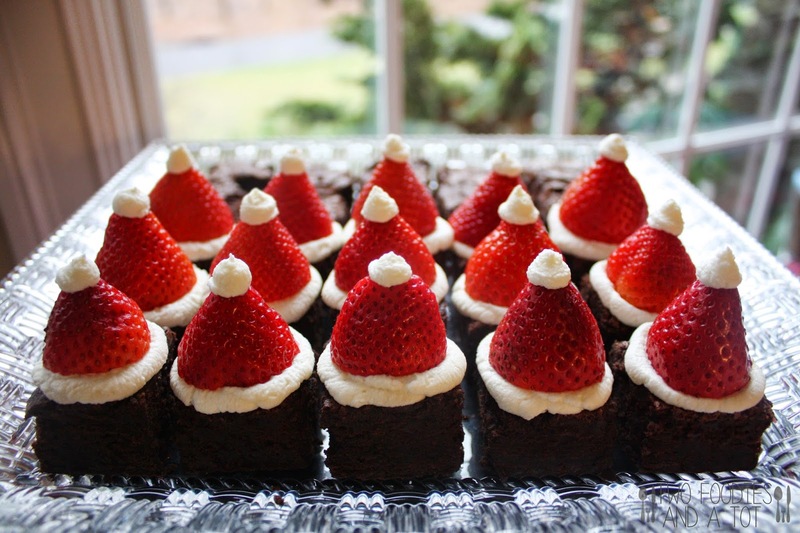 A couple of years ago, I saw a picture of brownie bites with strawberry Santa hats. Ever since then, I always wanted to make them. And I finally got to make them this year. Here. Aren't they adorable? For people who don't like strawberries, I served half with the hat, half without. A lot of recipes use butter cream but I made mascarpone whipped cream, which is my favorite kind of whipped cream. 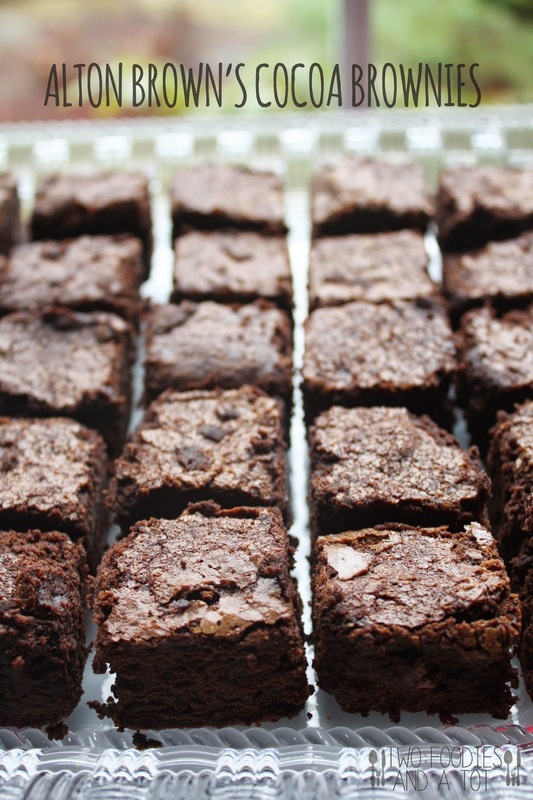 Cut the brownies into bite size- using a small circle or square cookie cutter works the easiest. Pipe a ring not too close to the edge, put a strawberry that you cut the bottom already on top and press it down gently. And pipe a little circle on top. There, you have a cute little Santa hat brownie bite. I don't bake brownies often. But when I do, there are only a couple of recipes I use. This Alton brown recipe is very fudgy not cakey. I love the richness. Giving a 15 minute rest out of the oven during baking definitely makes it extra fudgy. On food network original recipe, it is not mentioned but that's one of AB's recent tips. I also baked Christmas cookies, since it's a holiday party after all. Well..Christmas sugar cookies are so simple but it took me a while to find a recipe that doesn't need to be chilled, yet doesn't spread. I will be sharing that great find soon! 1. Preheat the oven to 300F. Line an 8 inch square pan with parchment paper, cut to size, leaving the edge hanging. It's better if you line with two pieces of paper on two sides so all four sides have hanging parchment paper to prevent sticking and easy lifting. 2. In a mixer fitted with a whisk, beat the eggs until light yellow. Add both sugars. Add rest of the ingredients. 3. Grease the parchment paper with a cooking spray and pour the batter. 4. Bake for 15 minutes, take it out and let it rest for 15 minutes. Keep the oven on. Put it back in the oven and bake for 25-30 minutes or until toothpick inserted come out clean. Do not over bake. 5. Let it cool in the pan for a few minutes and lift the parchment paper edges and move it to a cooling rack. Cut once it's cooled off. * Recipe by Alton brown.